There are some meals that were made to be eaten after a night out. This is most definitely one of them. In fact, the first time that I made this dish to post on Macheesmo, the night before was such a long night out on the town that all of the photos were horrible and I burned every part of the meal. So I had to make it again. My point though is that if you are capable of making something in a hungover state, I would encourage you to try this. It’s like corn beef hash, except with bacon and it is crispy and delicious. Once you get the technique for making hash though, you can really go crazy with it. 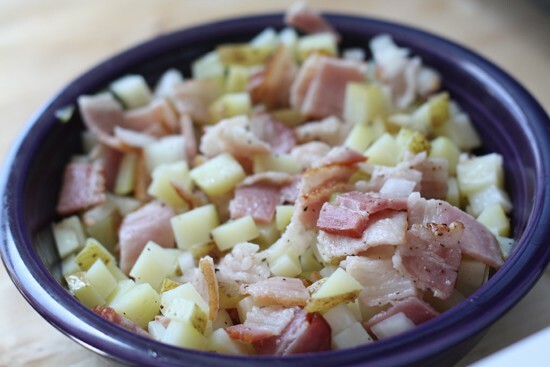 When I made the bacon version, I also made a more standard version with just potatoes, onions, and garlic, and then a third version with granny smith apples! 1) Wash the potatoes. Scrub the potatoes well to get off any dirt. 2) Cut the potato into horizontal sheets about 1/2 inch thick. Cut vertically down the sheets to form 1/2 inch planks or sticks. Turn the planks and cut them into 1/2 inch cubes. 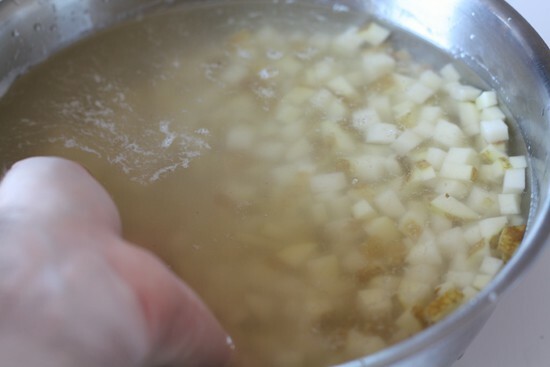 3) Give the potatoes a water bath. As you cut them up, just toss them in a large bowl of cold water. Let them sit for at least 5 minutes and swoosh them around some. 4) Drain the potatoes and pre-cook the potatoes one of three ways: Blanch the potatoes in boiling water for just a few minutes. Deep frying the potatoes at a much lower temperature, like 300, for a few minutes. Put them in a bowl and microwave on high for about 2 minutes. Then give them a stir and microwave for maybe another minute if they are still very hard. 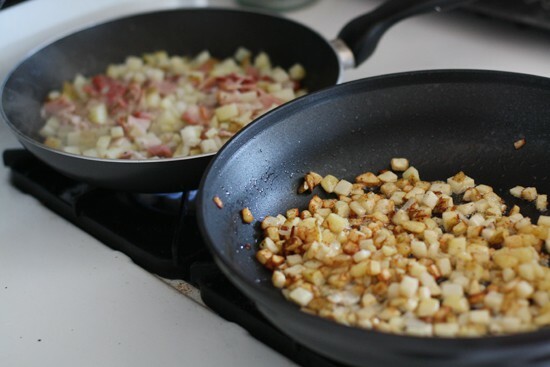 5) Mix in the onion, bacon, garlic, and salt and pepper. 6) In your best nonstick skillet, heat up a few Tablespoons of Canola oil. Once it is hot, add the hash mix! These will probably take between 10-15 minutes to cook over medium high heat. Stir them every few minutes also. If you notice that they are browning really quickly, then turn down the heat. 7) The hash is done when it crispy and has soaked up all the oil. If you are using bacon, that should also be nice and crispy. I like mine with hot sauce, but I know a lot of people prefer ketchup. – Wash it. Scrub the potatoes well to get off any dirt. I like to leave the skins on for a more rustic result. You could peel them though I guess. – Sheets. This is the first step in making cubes. Cut your potato into horizontal sheets about 1/2 inch thick. – Planks. Second, cut vertically down the sheets to form 1/2 inch planks or sticks. If you were making fries, you would be done! – Cubes. Finally turn the planks and cut them into 1/2 inch cubes. Once you get the hang of it, you can chop up potatoes pretty quickly. I think I can do a potato or two a minute without a problem. Of course, my speed at this task is inversely proportional to the amount of beer I had the night before. Here’s one photo that attempts to capture each of the three phases. A little bit of work. Worth it. There are two basic tricks to making perfectly crispy and wonderful potatoes. The first trick is that you need to wash off some of the starch that it is on the potato surface. This means giving them a water bath. As you cut them up, just toss them in a large bowl of cold water. Let them sit for at least 5 minutes and swoosh them around some. The really nice thing about this is that it means you can prep the potatoes the night before if you want. They can sit in water in the fridge overnight without a problem. The water will be murky and starchy. For the bacon, I tried par-cooking it a bit in the oven for about 8 minutes as I was a bit worried that it wouldn’t get crispy enough when I mixed it in with the potatoes if I started with raw bacon. This worked okay, but you run the risk of burning the bacon. If I did it again, I think I would start with raw bacon and just mix it in with the potatoes that way. Because the bacon is cubed, it should crisp up just fine. So I would advice against cooking it in advance after trying it that way. The right way to cook bacon. The microwave. It is a very rare day on Macheesmo that you will see me advocating the use of a microwave, but it’s really the best way to get the job done here. The goal is to just cook the potatoes a bit. This will cook out some of the moisture and make sure they get super crispy when we fry them later. For the purists out there who shun the microwave, there are two other ways you could accomplish this: 1) blanching the potatoes in boiling water for just a few minutes. 2) Deep frying the potatoes at a much lower temperature, like 300, for a few minutes. But I think microwaving is much faster and gets the job done just as well for this purpose. Just drain your potatoes out of the murky water and put them in a bowl and microwave on high for about 2 minutes. Then give them a stir and microwave for maybe another minute if they are still very hard. They should be softened and steaming, but not mushy at all. Then you can mix in your onion, bacon, garlic, and salt and pepper. This is the one time I recommend a microwave. One more quick note about the microwave deal. If you are making a lot of these potatoes, then it would actually be faster to use one of the other methods I mentioned. The microwave really only makes sense if you are just making a few servings. In your best nonstick skillet, heat up a few Tablespoons of Canola oil. 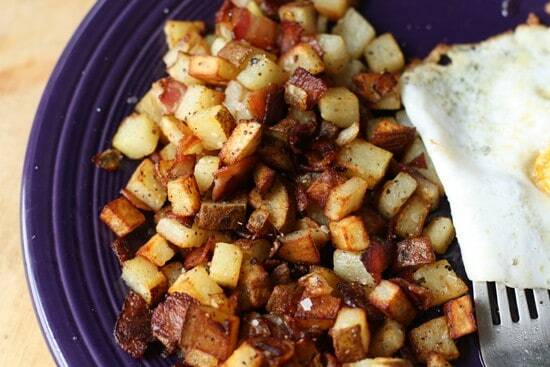 Once it is hot, add your hash mix! These will probably take between 10-15 minutes to cook over medium high heat. The potatoes will shrink a bit. Be sure to stir them every few minutes also. If you notice that they are browning really quickly, then turn down the heat. I also picked up a dozen duck eggs at the farmers market that I fried up. I had never had duck eggs before, but they were really good. 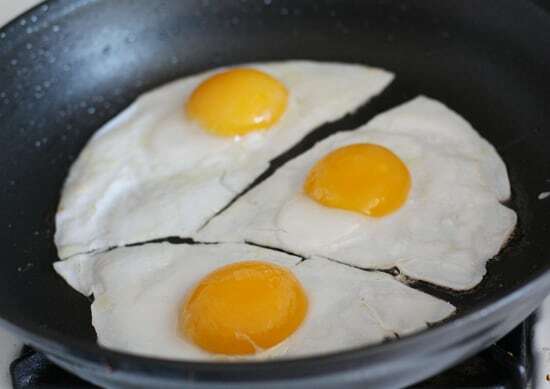 The yolks were probably 1/4 bigger than chicken eggs. And they had a much richer flavor. One egg was more than enough for me. Turns out duck eggs are good. You know your hash is done when it crispy and has soaked up all your oil. If you are using bacon, that should also be nice and crispy. I like mine with hot sauce, but I know a lot of people prefer the K-word. This and a tall cup of coffee and you’ll be on your way to a good day! Might need this Sunday morning before my bike ride. Tonight is shaping up to be a bender after a afternoon in the kitchen preparing BBQ ribs. We prepped this up ahead of time last night before a drunken stupor could settle in. “Drunken Chef Time” is always an experience, and this one was zen-like. Cooked it up for breakfast this morning and it was delicious!! Microwaved the potatoes, but couldn’t get them to really soften up. Still, once they were in the skillet, all went well. Next time I will add more bacon, and I was also thinking some yellow, summer squash would be a nice veggie addition. Final thought – this definitely needs to be prepped ahead of time and taken camping!! Damn. I love me some potatoes, bacon, and onion together. And we were drinking last night! I’m really glad for all the little tips, especially the potato preparation. I’d never understood how to get potatoes to cook up crispy like that. 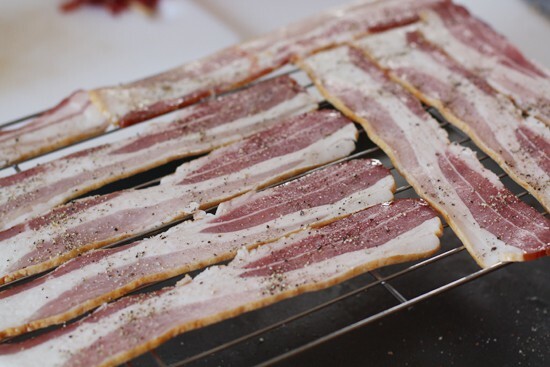 /me gets the bacon out of the freezer now to thaw for making this in a few days. I recommended people check out your site for the recipe, as I was focusing on how to cook this dish while you're camping. It was AMAZING!! Had to post that I made this last weekend and it was awesome. An over easy egg on top and a little hot sauce – Wow! Even my neighbors were drooling at the deliciousness they smelled down the street. Thanks! This is definitely my new Sunday morning special. Also wondering… Noticed in the pics the potatoes are in a separate pan. I did mine in the same pan. What do you recommend? This was excellent! My variant included the sliced-up stems of a beautiful bunch of red Swiss chard plus smoked and sweet paprika. Served with a fried egg on top and sautéed chard greens on the side. Love a leisurely weekend brunch. Thanks for posting! Wound up with a skillet full of mush, great tasting mush though. Gonna try it again and I think I will cook the bacon about 1/2 way before I add the potatoes and onions and garlic. It tasted great and everyone love it, but the taters didn’t hold together very well. Hey Steve, sorry for the mush! Sounds like maybe the potatoes were over-cooked in the precooking stage. That can definitely lead to mushy hash. Yeah I’m pretty sure that’s what it was. 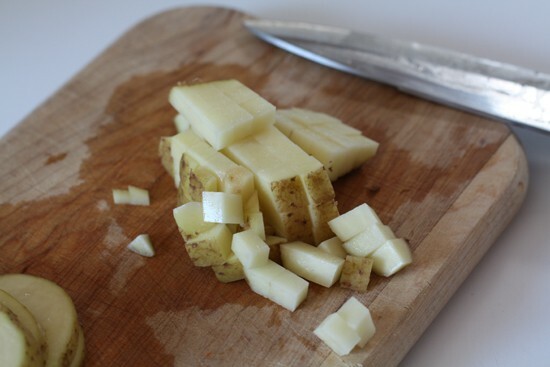 I cut the potatoes into really small cubes like I do when I make corned beef hash, I think that was problem #1. Then I over cooked them when I par boiled them, problem #2. And I wasn’t hungover when I was cooking, problem #3. It sure did taste good though, the whole family loved it. Gonna try again in a couple of weeks. I may cook the bacon and onion and garlic a bit before I add the potatoes next time and see how that turns out. Thanks for the recipe though, the mush problem was on the cooking end. Thanks Jared! So glad you liked it. I’m in need of a long night of poker! Ha! « Around the Internet Kitchen: Against the Odds Recipes Home » Review: Food, Inc.